When thinking about watches it’s easy to get caught up in the romance of a complex mechanical timepiece. Brands like Bulgari, MB&F, and Zenith are locked in a battle to produce increasingly complex and elaborate watch movements, while even mainstream players like Rotary insist on showing off the automatic movement of their watches with glass backs and skeleton mechanisms. All of this can make the humble quartz movement feel a bit inadequate. But fear not, because where self-winding movements win the prize for complexity and craftsmanship, quartz watches fight back with their low prices, increased accuracy, and almost zero maintenance. It is these three factors, spearheaded by Japanese brands like Casio and Seiko, which neigh-on decimated the traditional watch industry back in the 1970s, during a time the Swiss called the Quartz Crisis - and the rest of the world called the Quartz Revolution. Today, Quartz watches are generally cheaper than their more mechanical relatives, but some of the biggest Swiss names offer some four-figure options of their own. 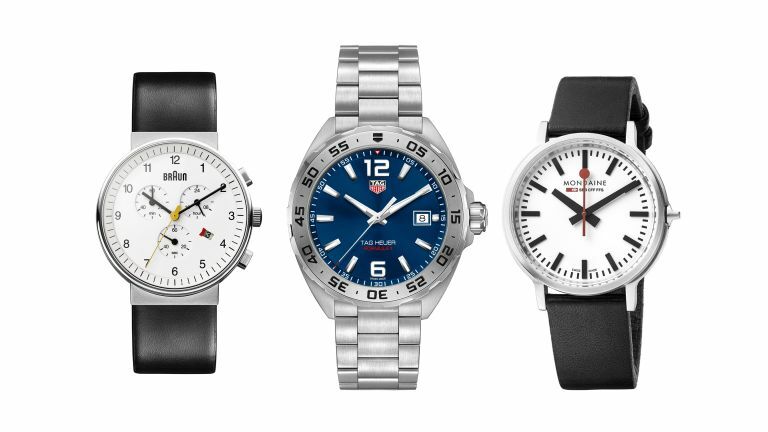 For example, both Omega and Tag Heuer have quartz options in their current lineup. So leave your prejudices at the door and join us as we introduce some of the best quartz watches on sale today. Mondaine is the official provider of clocks across the Swiss railway network. Located on station platforms, these clocks pause for two seconds at the end of every minute, then all begin the next minute at precisely the same time, to ensure all clocks across the network stay in sync. To mimic this, the 41mm Mondaine Stop2Go pauses for two seconds at the end of each minute, then the minute hand ticks into place before the second hand starts again. It’s a fun gimmick for watch lovers, but means the second hand can’t be trusted for accurate timekeeping - because it actually takes 58 seconds to sweep its way around the dial. Despite that, we love Mondaine’s simple, iconic design and think the Stop2Go makes a great addition for any collection. This 41mm watch from Tag Heuer is available in a range of different configurations and designs, most of which represent a nod to the company’s involvement with motor sport - hence the F1 name. Tag believes its battery-powered quartz movement is one of the most accurate in Switzerland, and claims it will only gain or lose an inaccuracy of a few seconds each month. This particular model has a brushed blue dial and rhodium plating on the hands and hour and minute markings. The case is brushed steel with a flat sapphire crystal and screw-down case back. Water resistance is 200 metres and the strap has a double safety system with diving extension. This watch has a large 45mm case made from lightweight titanium with a matching strap. It features a black ceramic bidirectional bezel and black dial with an integrated LCD display. This gives the Skywalker X-33 something of a split personality, where a conventional case, bezel and set of hands is blended with a digital display. The display offers up several features, like a stopwatch, up to three different time zones, three alarms and a perpetual calendar. The Skywalker is water resistant to 30 metres and Omega claims the battery has a life of two years. The quartz movement was tested and qualified by the European Space Agency. A design classic, the BN0035 takes Braun’s familiar look and adds a three-dial chronograph. The watch has a 40mm case so is fairly compact by modern standards, and is also relatively slim at 9.4mm; it’s built from stainless steel and is water resistant to 5 ATM (50 metres). The case is built from stainless steel, while the strap with traditional buckle clasp is leather. The watch is offered in all-black with a matching strap, or with a silver case, white face and black strap. This compact quartz watch by Timex is best -suited to slimmer wrists with its 38mm case and 18mm strap. The stainless steel case houses a black dial with 12-hour and 24-hour markings, plus a date complication at three o’clock. The Waterbury United is inspired by military design and is intended as a watch suited to the great outdoors. The clear dial with red and white numbers, plus the stone washed leather strap help make this feel like an outdoorsy timepiece, rather than one to be paired with your dinner jacket. Extra features include water resistance to 50 metres and Timex’s Indiglo back-lighting. The Swiss-made Tissot PRC200 is offered with a wide range of straps and faces to suit any style. All models are water resistant to 200 metres and feature a three-dial chronograph with stopwatch accurate to 1/10th of a second. The case is 42mm wide and 12mm thick, made from stainless steel, and uses a screw-down crown and case back. Other options for the PRC200 include stainless steel straps, and different colour options for both the dial (black, blue, silver) and the second hand, which can be had in contrasting red or yellow, boosting the watch’s sporty nature. There are currently 13 different versions of the Longines Conquest VHP, so you should find exactly the right model for you. Strap options include stainless steel and rubber, and dial colours include black, white, blue, and a finish resembling the weave of carbon fibre. The case is 41mm in diameter and is water resistant to 5 ATM, while the face is protected by scratch-resistant sapphire crystal and includes several layers of anti-reflective coating applied to the underside. Citizen’s Eco-Drive system takes light - natural or artificial - and turns it into energy, which is stored in the watch and deployed gradually. This means the battery never needs replacing, and enough energy is stored to power the watch for six months, even in complete darkness. Not replacing the battery is convenient, but also means the watch’s 200 metres of water resistance is never tampered with by opening up the stainless steel case. This particular model of Nighthawk features a blue dial and a black steel case with is 43mm wide and 12.5mm thick. The date is displayed at the four o’clock position and the face includes a two-dial chronograph with a stopwatch accurate to 1/5th of a second. This diving watch by Sinn is water resistant to a massive 5,000 metres and is designed to remain perfectly legible under water and in any conditions. A lithium-ion battery means a long life, but also ensures the watch continues to work in extreme temperatures - down to minus 25 Celsius and up to plus-60C. The simple black dial with white hours markings has a date complication at four o’clock, contrasting red second hand, and a rotating diving bezel with luminous markings. A fairly large watch, the case measures 44mm across and is 13.3mm thick, while the band lug width is 22mm. The Pilot 41 by Enclave has a 42mm case which is just 7mm thick. The watch takes standard 20mm straps if you want to jazz things up from the standard-issue brown suede leather, and the stainless steel case is water resistant to 5 ATM. The large, clear face features a two-dial chronograph with stop-stop-star and reset buttons, plus a date complication a the three o’clock position. Enclave sells the Pilot 41 with a navy face, as seen here, and ivory. Both are protected by sapphire crystal and should make an attractive, bold statement on any wrist.